We are greatly indebted to Dr. Graham Dowler’s excellent reference book “Gloucestershire Clock and Watchmakers” (Phillimores 1984) and to Sir George White of The Worshipful Company of Clock-makers (at Salter’s Hall, Fore Street London, EC2Y 5DE) for sources of information about clock-makers. We have no expertise on the subject of clocks but while we were researching the history of Thornbury we became fascinated by the number of clock and watchmakers associated with the town. We have created this webpage to bring together what we know about these people and to show images, where available, of examples of their clocks. We would love to hear from anyone who has a Thornbury clock or who has further information about any of the clock-makers. Sadly it would seem that there was not such a wonderful artisan tradition of clock-making that we had at first supposed when we first saw the long list of clock-makers. The reason for the large number of clock-makers in the nineteenth and early twentieth century may lie instead in developments in technology. The Museum has the workings of an eight day long case clock put together by Henry Wilks in Thornbury between 1813 and 1828. We have a photograph of this on the left. William Francis was a prolific dial maker who worked first at Birmingham from 1810 to 1831. The implication is that what we have in many cases is the result of the flowering of nineteenth century ingenuity and the growth of mass production rather than the presence of so many gifted local craftsmen. This enabled shopkeepers who were not great artists in clock-making to put together the various mass produced components of a clock to suit a particular customer. Collings – some of Thornbury’s most notable clockmakers were members of Collings (or Collins) family. We have collected so much information about this family that we have created a separate page for them. 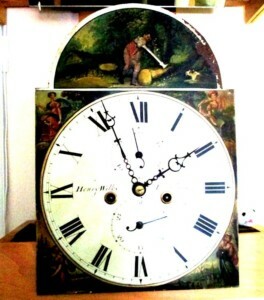 The image on the left shows a one-handed clock, thought by the owners to have been made by Thomas Cox. There were two clockmakers called Thomas Cox who were uncle and nephew. Clocks made by both generations of Thomas Cox still exist and both clockmakers at times used the inscription “Thomas Cox of Cromhall.” One of these clocks, a one handed clock, was once in the possession of Hubert and Edna Fudge of Thornbury and members of his family have kindly sent us this photograph of it. It says that it is made by Thomas Cox of Cromhall and so we are uncertain which Thomas made it. However, because it is a one handed clock we have provisionally assumed that it is an older example and likely to be the work of the first Thomas Cox. Dowler says that the older Thomas Cox married a lady called Mary but her surname is unknown. We know from the inscription in Thornbury that she died on 5th November 1739 aged 61 was buried on 22nd November 1739. Thomas Cox’s will mentions “my nephew Thomas Cox son of my brother Charles Cox deceased.” We know that Thomas’s brother Charles Cox of Alveston had died on 29th October 1737 aged 38. Thomas Cox senior died on 18th December 1740 aged 42 and his will was proved on 5th January 1740/41. We know from an abstract of title and land tax records from 1775 to 1783 that Thomas had his shop at what later became known as 21 High Street. Following Thomas’s death, his widow Mary continued the business. She was described as a clockmaker in the Trade Directory for Thornbury of 1794, even though she had remarried in 1791 and become the wife of William Williams. 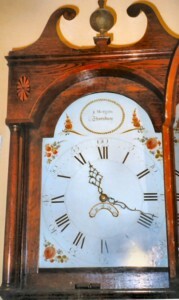 The clock shown here on the right was made by Samuel Davis in Thornbury about 1830. It can clearly be seen that the clock has a painted dial which may have been made elsewhere, possibly Birmingham. We have some confirmation that Samuel and his family were living in Thornbury at this time. Thornbury parish records show the baptism on 14th May 1834 of Pamela Davis the daughter of a watchmaker Samuel Davis and his wife also Pamela. On the 8th July 1835 there was the baptism of another of their children Samuel Henry Davis. The 1851 Census shows that Samuel Davis was actually born in Wiltshire. In 1851 he was aged 43 and a watchmaker then living in Newnham in Gloucestershire. His wife Pamela aged 36, a dressmaker was from Cromhall near Thornbury. Their daughter also Pamela was aged 18 and a dressmaker, born in Thornbury. Eliza aged 12 was born in Cromhall, which suggests that the family had moved from Thornbury by 1839. Rosa aged four was born in North Nibley and Sarah Davis aged four months was from Newnham. Dowler says that “The Early Clockmakers of Great Britain” (B Loomers 1981) tells us that Nicholas Jenkins made a Bristol Turret clock in 1610. The Town Trust records contain Caffall’s notes on a memorandum of 30th May 1634. The memorandum says that the money was collected from the free gift of Peter Hawksworth, John Jones (shoemaker), William Jones (shoemaker), John Bird, Phillip Harris, John Jones (mercer), Edward Thurston, John Thorne, William Jones the younger (mercer), John Clark, John Warner, Thomas Alpass, William Jones victualler etc. 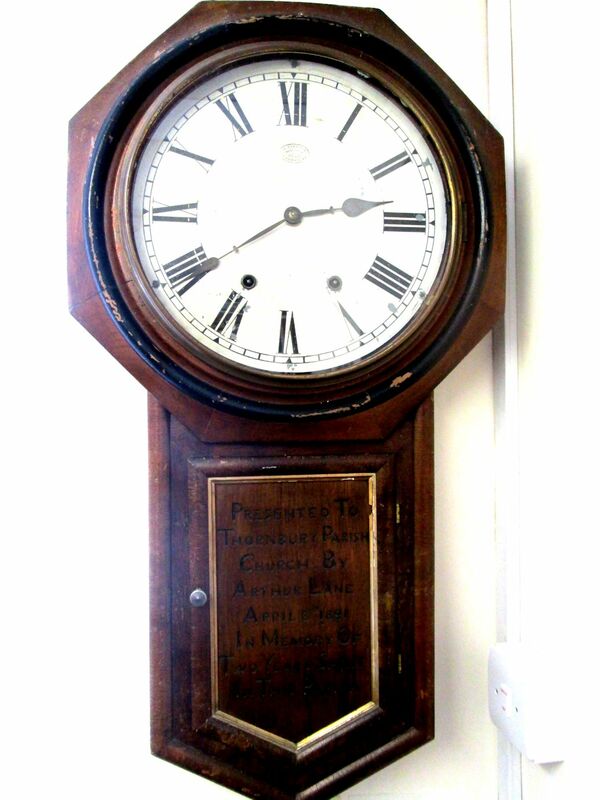 The money was for “a new good and sufficient clock well going” which would be set up within the Town Hall of Thornbury. Dr Dowler says that there was a clockmaker called Milwart in the Thornbury area about 1830 and cites “a painted dial wall clock with alarum.” However we have not yet found any mention of someone with this name in the area. We know that a Bristol Directory of 1775 shows John Morgan was a clock and watchmaker at Broad Ware or Broad Weir. “John Morgan jun. Clock and Watch-maker, engraver etc from Broad Street respectfully begs leave to acquaint the customers of the late Mr Cox and the neighbouring inhabitants in general (Mrs Cox having informed him that she would not continue the business) that he now carries on the above business in all their various branches, opposite the Market Place in Thornbury, where he makes and carefully repairs horizontal, repeating and other watches, Church, Turret, Chime, Quarter and plain clocks of various Constructions. Gold rings etc. He also makes the truest sun-dials either horizontal, erect or in any other position. Electrical machines and apparatus, thermometers, barometers etc. Coats of Arms, Crests and Cyphers engraved on plate, seals etc. Those who please to favour him with their commands may rely on having their work executed in a complete manner, and on the most reasonable term; and as he has given general satisfaction to his employers in Bristol, hopes by a strict attention and punctuality to orders to merit the countenance and support of the Country. 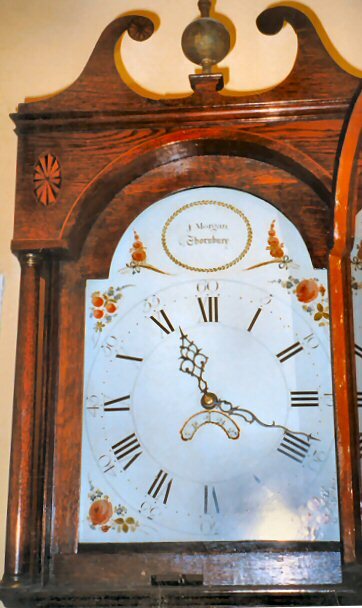 Thornbury Museum asked for comments from Sir George White about the clock shown above which was made by John Morgan. His comments tell us more about the nature of clock-making at this period. At least one Website on the Internet describes James Wilson as the best dial maker of his day. He started his business around 1772. Zimri was buried in Thornbury aged 67 on 7th February 1806. There was an inquest and we understand that the verdict was “visitation of God.” The parish register describes him as a clock and watchmaker. However we have no records of him living or working in Thornbury. We know that Thomas Savery was a journeyman clock and watch maker and that he and his family lodged with Ephraim Wilson in the Horseshoe Inn at 25 and 25A St Mary Street in the 1851 Census. Click here to read more about Thomas Savery. William was born in 1859 and died in 1947. The photograph on the left is of a clock by W Yarnold is on display in Thornbury Museum. Read more about the Yarnold family. Percy Balls from about 1897 to 1904. Click here to read more about Percy Balls. John Brown The clock that is shown on the right in a thumbnail image (please click on it for a larger photograph) was advertised for sale by “It’s About Time.” The advertisement described the clock as a good example of a painted or japanned dial and says that the clock has a Hood door which is a typical Bristol style. J. Brown was said to have moved from Bristol and worked in Thornbury from 1792. We are aware that John Brown was a tenant of what is now 36 High Street in Thornbury from 1792 to at least 1797.